CALL ABOUT PROPERTIES FOR SALE! 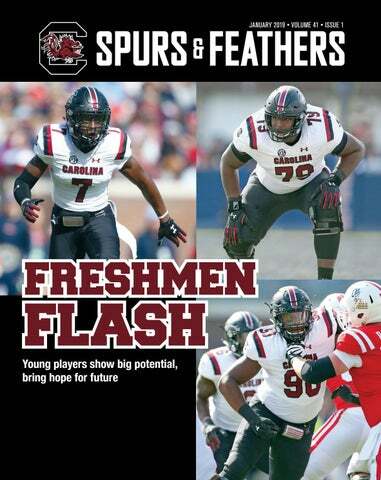 purs & Feathers is the official publication of the University of South Carolina Gamecock Club. It is published monthly, 12 times per year and is available to Gamecock Club members as well as additional subscribers. To opt in or subscribe, email subscribe@ spursandfeathers.com or call 843-853-7678. Signing Class: ‘We got better’ Belk Bowl Recap: What happened? 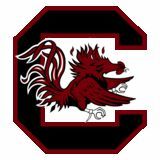 outh Carolina ended the 2018 season with a humiliating 28-0 loss to Virginia in the Belk Bowl. The shocking outcome was so discouraging that head coach Will Muschamp apologized for his team’s lackluster performance (see page 16). Fans were understandably frustrated by the loss and the way the team finished the season. A year ago, Muschamp led South Carolina to a 9-4 record capped by an impressive win over Michigan in the Outback Bowl. A year later, the Gamecocks struggled and lost three of its final five games to finish 7-6. The last three losses were troubling — a 21-point, fourth-quarter collapse at Florida, a 56-35 loss at rival Clemson and the program’s first shut-out loss in 12 years in the bowl game. For many, the disappointing season diminished faith in Muschamp and served as evidence that the program is not headed in the right direction. But that couldn’t be further from the truth. time, Muschamp calls them “SEC linebackers.” They should be more prepared to make an impact next season. Bolstered by another top-25 recruiting class — led by five-star defensive end Zacch Pickens and others who should help right away — South Carolina should benefit from an increase in talent the next few years. That should give Muschamp the players he needs to take the next step and put South Carolina in a much better position to compete in the SEC East and challenge rival Clemson. While the 2018 season was a definite setback, the growing pains should pay immediate dividends, giving Gamecock Nation hope for the future. Jeff Owens can be reached at jowens@spursandfeathers.com or on Twitter @Jowens_SpursUp. HERE TO HELP PROTECT WHAT MATTERS MOST IMG is a full-service insurance agency located in Columbia, SC. Our dedicated team of specialists, with over 150+ years of combined experience, provides ongoing support of your employee benefit programs, commercial, and personal insurance needs. We represent multiple national carriers ensuring the best solution for you, your family, and your business. Let IMG take on the complexities of insurance because we’re here to help protect what matters most. Those guys being able to play and take their bruises and take their licks and take their losses now, later on down the line it is going to help them because they are going to understand they don’t want to go through this feeling again.” Linebacker and defensive captain T.J. Brunson had to play with freshmen beside him at times, with freshmen in front of him on the defensive line and freshmen behind him in the secondary. He believes the experience they gained will pay off next season. “Those guys are hungry and they don’t really care who is in front of them and whether they are starting or not, they come out to practice every day trying to get better and take the coaching,” he said. “I am excited to see those guys develop.” Here’s a position-by-position look at the freshmen who played this year and their potential moving forward. good bit.” Bentley was impressed by the confidence Wonnum brought to the offense. “There really wasn’t any drop off. He just responded really well and continued to get better each and every week,” he said. WR Josh Vann Vann, a highly recruited wide receiver, played in every game and started twice. He finished the season with 18 catches for 118 yards and a touchdown. Vann missed spring practice last year after shoulder surgery but came on strong in fall camp and worked his way into into the receiver rotation, out-playing more experienced pass catchers. “He came in and stepped up and made some plays,” Smith said. “That says a lot about his progress and his intelligence,” Muschamp said. Bentley became more confident in Vann as the season progressed and found him for a key touchdown reception in the win against Ole Miss. “I think he’s just gotten more mature. You can just see maturity in the way he prepares for the game, knowing what he needs to do throughout the game to stay locked in and be able to come in, whether it’s the third quarter or first quarter, and make plays,” he said. “I’m really proud of him for the way he has grown this year and his knowledge. He wants to get bigger and he wants to get better. 1Bdrm/1Bath -or- 2Bdrm/2Bath starting at just $167,850! *Derek Boykins, LB Size: 6-2, 208 Hometown: Concord, N.C. High School: Central Cabarrus Stats: 117 tackles, six for loss, four sacks, three interceptions and three forced fumbles as senior; 79 tackles, including eight for loss, two forced fumbles and two fumble recoveries as junior. Ratings: No. 22 player in North Carolina, No. 26 outside linebacker and No. 519 overall by 247; No. 11 inside linebacker by ESPN. Stats: Led Bulls to 10-5 record and 6A state championship. Ratings: No. 73 player in Florida, No. 43 OT and No. 579 overall by 247; No. 31 OG by ESPN. Accolades: Led team to 6A state championship after 0-4 start. Muschamp: “Mark was on a state championship team. Tyquan Johnson, WR Size: 6-3, 180 Hometown: Sylvania, Ga. High School: Screven County Stats: Caught 32 passes for 661 yards and 10 touchdowns as high school senior; 32 catches for 822 yards and 13 touchdowns as junior. NUMBERS THAT MATTER South Carolina was shut out for the first time since an 18-0 loss to Georgia in 2006. It was the first time Carolina was shut out in 23 bowl games. C Hank Manos made his first career start. DT Jabari Ellis had his first career sack. QB Jake Bentley ended his season with 3,171 passing yards, third on Carolina’s single-season list. LB T.J. Brunson led the Gamecocks with 12 tackles, giving him 106 for the season and 206 in his three-year career. Charlton averaged 45.2 yards on five punts, with a long of 59 yards. For the season, Charlton, a secondteam All-SEC punter, averaged a school record 44.8 yards and ranked 12th in the nation. He is South Carolina’s career leader with a 44-yard average. Carolina had four players start all 13 games — offensive linemen Donell Stanley and Sadarius Hutcherson and linebackers T.J. Brunson and Sherrod Greene. The Gamecocks are 22-17 in Will Muschamp’s three seasons after finishing 7-6 in 2018. Shi Smith had a career-high 62-yard kickoff return. He also led the Gamecocks with six receptions for 76 yards. Rewarding you for being part of My Carolina. Since college, you’ve worked hard to get to where you are today. Let Nationwide protect what makes up your life, so you can focus on the things that really matter. Because you are an alumnus of the University of South Carolina, Nationwide is offering you exclusive insurance discounts on your car, motorcyle, and more. un-shhh. un-zzzz. unveiled. A redefining art experience. touchdowns in a 48-44 win over Ole Miss, but none may have been more important, or at least more electrifying, than the first. Samuel took the opening kickoff 90 yards for a touchdown against Mississippi, silencing the Oxford crowd and proving the Gamecocks could go toe to toe with the high-octane Rebels. on the mark(way) With the Gamecocks trailing 35-34 with 42 seconds to go in regulation and with the ball at its own 42-yard-line, Kyle Markway caught a pass from Michael Scarnecchia — who started with Jake Bentley out with an injury — for a 27-yard gain. It was just one of three catches the Missouri native had this season, but it set up a Parker White game-winning field goal with two seconds to go. 87 GOES FOR 67 South Carolina’s offense put up one of its best performances ever against Clemson, rolling up 600 yards and scoring 35 points against the nation’s No. 2 defense. One of the team’s longest gains came midway through the second quarter when tight end Kiel Pollard caught a Bentley pass on a crossing route and took it 67 yards for a touchdown. WHITE DOES RIGHT Last season it was Louisiana Tech, this season it was Missouri and Tennessee. But in the battle of Parker White game-winning field goals, we’ll give the nod to the winner against the Tigers because it was from a longer distance (33 yards vs. 25 yards) and the Gamecocks trailed. His game-winner against the Vols came with the game tied. A&M 16-0 late in the third quarter before Bentley found Shi Smith for a 22-yard touchdown. The Gamecocks went for a 2-point conversion, which they converted on a Bentley-to-Byran Edwards connection. After Chavis Dawkins caught a touchdown four minutes later, Bentley found Edwards again on another 2-point connection. The 2-point conversions completed a 16-point rally and tied the game entering the fourth quarter. A.J.’S big DAY A.J. Turner scored three touchdowns in the first half in the Gamecocks’ blowout win over Chattanooga, but none was more exciting than the second: On a second-and-goal from the 6, Bentley rolled left and, just feet from the sideline, heaved a pass toward the back right of the end zone, where Turner reached up for it while his feet were planted inches from the end line. score against Clemson came five minutes before halftime. In a formation with just four offensive linemen, Samuel caught a crossing route out of the right slot and went for a 75-yard touchdown. DEEBO CAN CATCH Another explosive play from Samuel in a loss, but when the junior caught a laser from Jake Bentley early in the third quarter of SC’s loss to Kentucky and took it 58 yards for a touchdown, it brought the Gamecocks to within two scores. It was a typical makesomething-out-of-nothing play, with Bentley scrambling and finding Samuel, who raced 35 yards for the touchdown. ore than any other moments during non-conference play, Colonial Life Arena crowds became the most excited — and had the most anticipated excitement — whenever Keyshawn Bryant swiped a steal and had nothing but daylight between him and the basket. Sometimes it was from inside the 3-point line. Sometimes half-court. But wherever it was from, there was an audible gasp and a you-better-watchthis anticipation. “The only thing going through my head [during those moments] is to get the basket. But you know me, I like to put on a show,” said Bryant, the South Carolina freshman forward. “Every time I’m on the break, it’s just my moment. It’s time to bring the crowd out.” Bryant, through South Carolina’s non-conference play, was fourth on the team in scoring, third in assists and blocks and tied for fifth in rebounding. After SEC games against Florida and Mississippi State, the 6-6, 175-pound wing was averaging 9.1 points, 3.6 rebounds and multiple highlight-reel plays per game. Some, though, have labeled Bryant an “athlete,” a term in basketball circles that underscores the fundamental talent and skill a player has. “I won’t say it’s a negative, but I don’t see myself as just an athlete,” he said. “I feel I have more things that I can do. But people label me as just an athlete, so they really don’t get to see that. “When they see me doing more stuff than just dunking, they’ll be surprised what I can do.” Those electrifying dunks, after all, would not be possible if not for Bryant’s ability to read offenses and to know when to jump passing lanes. “He’s got what I call basketball instincts. Like he knows, he can feel a pass. He kind of knows how to get out in the open court and go get a basket,” Gamecock head coach Frank Martin said. “You know, there are some guys that are faster than him and never get a breakaway. “But yet he’s got that knack for that breakaway. He’s got those instincts.” Those instincts, Bryant said, formed during his high school career, and it’s those instincts that have led to the SportsCenter Top 10-worthy dunks. 9 of 11 free-throws and, oh yeah, defended Aggie star guard Chennedy Carter for most of the night. “There are very few players that have the offensive prowess as Te’a Cooper, that embrace the challenge of playing someone that’s very talented like Chennedy Carter,” Staley said the next day. “… They want to outscore them, but they don’t want to shut them down. “Te’a took on that [challenge]. That’s her personality.” Through the first two games of SEC play, Cooper was averaging a team-high 12.6 points and was the Gamecocks’ leading scorer in seven of 14 games. But her play was inconsistent: She led the team in scoring in four of its first six games but was fourth in scoring against East Tennessee State and fifth against Dayton. She dropped 31 points against Drake but just two against Purdue. She had four points against Furman on Dec. 30. Then came the chat with Staley, something she agreed was more common than some made it out to be. Noah Campbell and infielder/outfielder Jacob Olson. Hopkins decided to return for his senior season instead of turning pro and brings valuable leadership to a young team. He hit .345 in an injury-riddled 2018 season and will either hit at the top of the order or in the middle of the lineup. Campbell, who started at DH and in the outfield as a freshman, was one of the top players in the elite Cape Cod League last summer and Kingston calls him “one of the better hitters in America” and a “borderline All-American.” He took over the second-base job in the fall and likely will hit at the top of the lineup again. Olson, a senior and two-year starter, worked at third base in the fall and could start there or move back to the outfield. He led the Gamecocks in extra-base hits last year with 12 home runs and 20 doubles. Voted Best Brunch three times by Free Times, Columbia Metropolitan, and The State Newspaper! Saturday and Sunday 10 am - 2 pm! Pick up our Famous Pimento Cheese and other Gourmet items, or order from our Catering Menu to take home! Cameron Smith. I believe Muschamp has continued to upgrade the talent across the board and this class once again shows that with talented players at quarterback, wide receiver, offensive line and on defense. None of this makes us forget the way the 2018 season ended, and it shouldnâ&#x20AC;&#x2122;t as the team needs to remember the feeling at the Belk Bowl. But I think Muschamp was tasked with a difficult job upon arriving, one that is made more difficult by the success of the Gamecocksâ&#x20AC;&#x2122; two biggest rivals in Clemson and Georgia. Steps to improve and become nationally relevant again are being made, but patience is going to be required as we turn the calendar to 2019. Bill Gunter is the co-host of the Early Game on 107.5 The Game in Columbia. Follow him on Twitter @WillGunter.  an Dream It.. If You C . We Can Build It! Partner With An Award Winning, Established and Respected South Carolina Swimming Pool Company With Endless Referrals of Satisfied Customers. Owned and operated by Bill Muller, USC team captain for â&#x20AC;&#x2DC;66, â&#x20AC;&#x2DC;67, â&#x20AC;&#x2DC;68 Swim Teams. Since 1972 â&#x20AC;˘ South Carolinaâ&#x20AC;&#x2122;s Largest and Oldest Pool Builder! Ed Girardeau is a 1982 South Carolina graduate and has been a columnist for Spurs & Feathers since 2012.You can reach him at edgirardeau@spursandfeathers.com. SENIOR RATES/STUDENT/MILITARY $22 MON.-FRI. $27 SAT.-SUN.-HOLIDAYS GUEST $30 MON.-FRI. $34 SAT.-SUN.-HOLIDAYS TWILIGHT SPECIALS EVERY DAY! Stay Well Connected LMC MyChart makes connecting to your our ave health care easier than ever. Patients have 24/7 access to their Lexington Medical em Center physician practices â&#x20AC;&#x201C; letting them schedule and request appointments, make ake payments, review test results, request prescription refills and more. And they can do it all from their computer, tablet or smartphone. The official publication of the Gamecock Club.